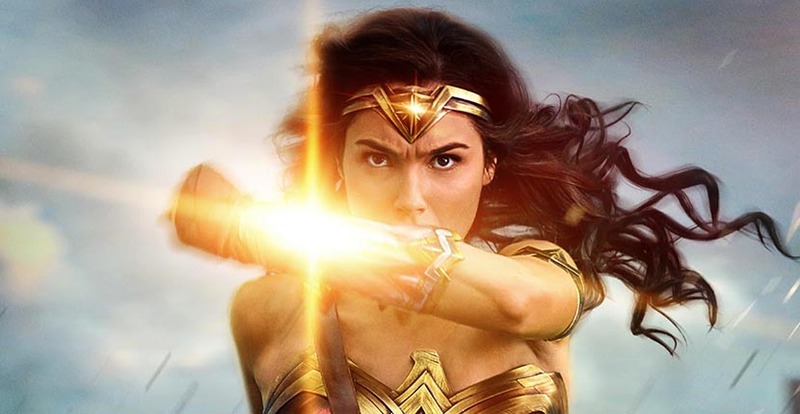 Of course, the bracelets deflect bullets in the manner of the famous jewels worn by Lynda Carter in the great 1970s-television series, but there is a much bigger mythology. 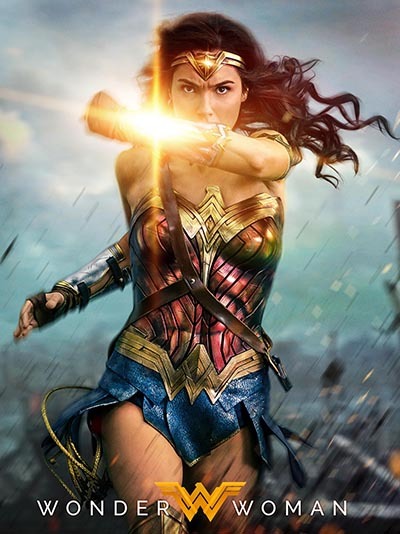 When Diana clashes them together they form a powerful concussive force field that thwarts attackers. 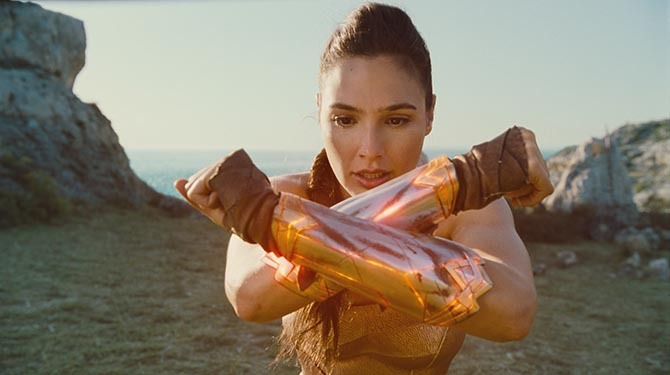 At the moment when she is beginning to realize her powers in the movie and this effect goes into action she seems surprised by the power of her jewelry. Diana has yet to realize she is a goddess, an immortal super hero. Nothing is precisely spelled-out about the accessories in the movie. 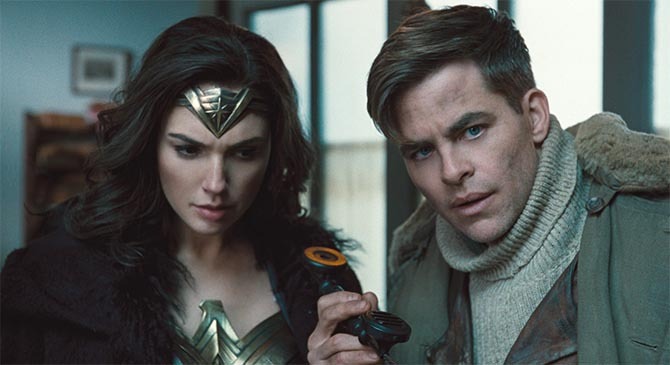 Luckily, a few different explanations have been given in DC Comics over the years since Wonder Woman was invented by William Moulton Marston in 1941. It seems the force field power is part of one storyline that the bracelets are made with Aegis from the shield of the she-goat who suckled Zeus as an infant. 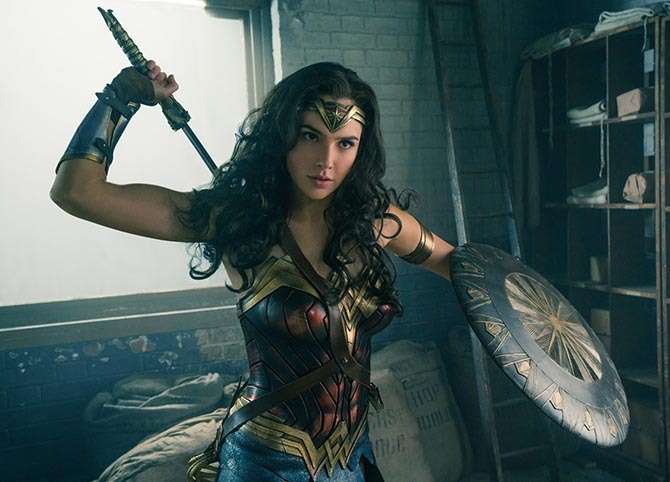 Wonder Woman mythology is heavily intermingled with ancient Greek myth. Another reason all the Amazons wear a pair of bracelets is as a reminder of their period of enslavement by Hercules and their failure to stop the conflicts in the world. 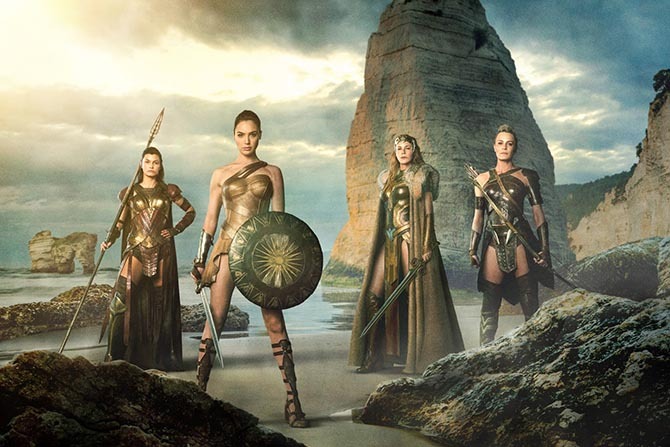 This mission is the reason they beat a retreat to an all-female island Themyscira where they are more or less protected by Zeus but always training for the possible return of Ares, the god of war. It’s complicated. One of the most fascinating stories behind the jewels is that they provide a sort of balance to Diana and the Amazons between peace and battles. They were originally named the Bracelets of Submission, because they reigned in the women’s incredible powers. In essence, they acted as reminders of the importance of love. If they were removed, the legend reveals, the Amazons would go wild with fury. This storyline may or may not be part of the new Wonder Woman. The mythology has changed here and there over the decades. 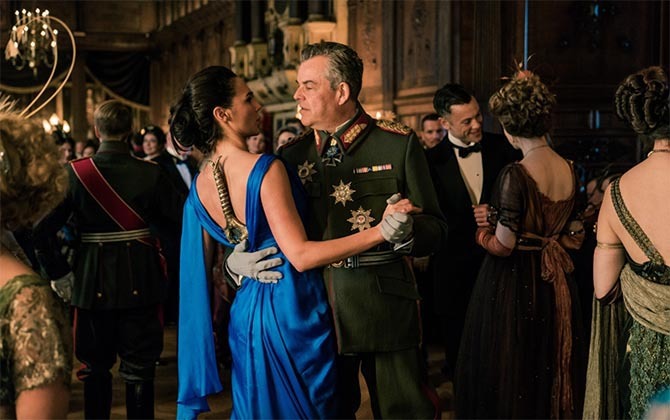 In one scene, when Diana is going after the man who is the personification of war in the modern world, she appears at a formal ball without her bracelets. Her sword is not too subtly secured down the back of her dress. Perhaps the bracelets were not worn because she was channeling all her strength for the fight. It’s possible the costume designer felt the bold jewels with leather underpinnings just didn’t work with the formal attire. Although I think they would have looked great. Or maybe they were not worn because Gal Gadot’s Wonder Woman makes her own decisions and she decided to leave them off for that moment. Whatever the case may be, the jewels return quickly. I like to believe they came back because they are a symbol of Diana’s fight for peace and her ultimate belief in the power of love—part of the symbolism behind her jewels.